(1) Dora 30 inch Black Lacquered Bathroom Vanity with Tempered Pre-Fabricated Reflective Glass Top (Black Color) - Flawlessly flattering and seductively seamless. This luxury Italian bathroom vanity is breathtaking in its design and unrivaled in it�s craftsmanship. This vanity is shown in 19.8 inch black lacquered finish, handmade in 30 inch width. 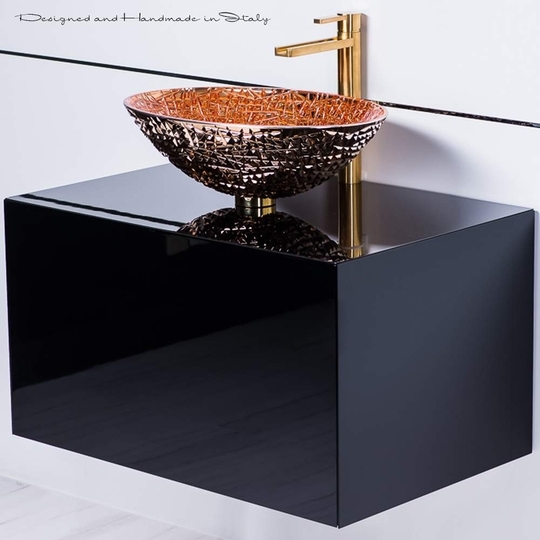 (2) De Medici Ice Oval Rose Gold Crystal Vessel Sink - Brilliance with exceeding opulence, the De Medici Ice Oval vessel� sink, is an expertly� cut showpiece, royally formed into a master works of art. This vessel sink jewel, with its high grades of clarity, cut, and carat � ignites the attributes of a perfectly sculptured diamond. This luxury vessel� sink makes an intense statement with its ability to reflect light, and though it will compliment a contemporary style best, it will also enhance a transitional design setting. Made out of luxurious crystal based material enhanced with its true color. (3) Aqua Brushed Gold Luxury Bathroom Faucet - This two-piece luxury bathroom faucet is a beautiful focal point in any bathroom. The high end Italian faucet has adjustable height which can accommodate any type of bathroom sink. The contemporary waterfall faucet is easy to install, keep clean and maintain. The modern faucet is made of lead-free brass.